Impact craters of M64 500-pound (227-kilogram) general purpose bombs are seen all around the Marifu Rail Yards at Iwakuni on Honshu. The 6th and 9th Bomb Groups of the 313th Bomb Wing, 20th Air Force, launched 114 aircraft, of which two bombed the town of Sanagoseki and one aborted. The aircraft completing the mission dropped 709.8 tons of explosives from 15,800-18,500 feet (4725-5340 meters). The target was judged to by 92% destroyed. No fighter opposition was encountered, antiaircraft artillery was light but accurate. 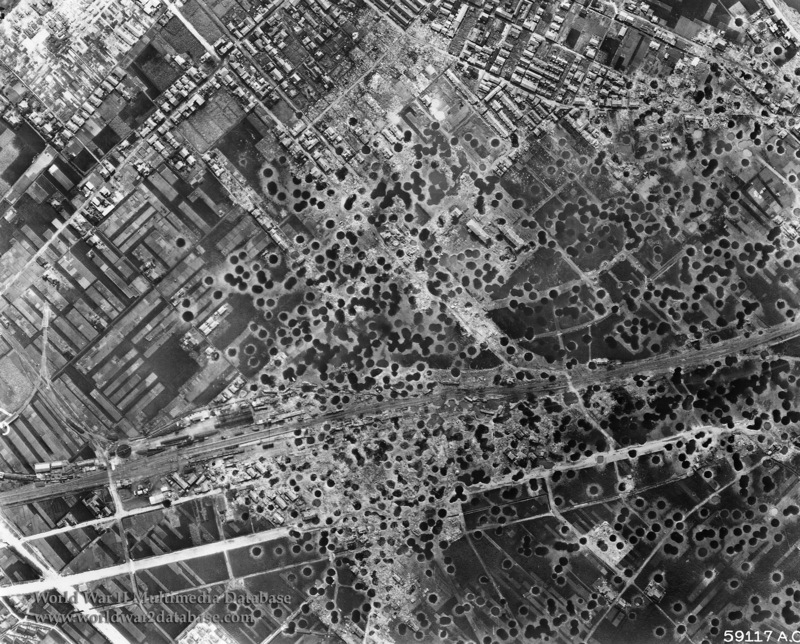 The final raid before hostilities ceased was a 725 plane effort divided among the arsenals at Hikari and Osaka, the rail yards at Marifu, the oil storage plant at Akita, and the urban areas of Isekazi and Kumagaxa. Many of the pilots, air crew and ground crew had been partying, and they were incredulous that tactical missions were scheduled. Some men had to be assisted to their planes. The raid on Akita was the longest mission of the war.